Cavity walls were first built in exposed coastal areas in order to keep out wind driven rain. The outer wall provided a perfect barrier to protect the wall on the internal side of the cavity from penetrating damp. For years government and homeowners have been keen to insulate homes using retrofit insulation to fill the cavity with blown fibre, polystyrene beads or insulating foam. This decision has come back to haunt many with horror stories about dry homes that have become damp following cavity wall insulation. It transpires that, save for homes in particularly sheltered areas, brick faced cavity walls are highly susceptible to penetrating damp caused by wind driven rain, with the result that blown fibre insulation may become wet and cold. With other insulation types, such as foam or beads there is a risk that moisture will be able to travel across voids in the cavity insulation to form damp patches on internal walls or cold spots,.which could lead to condensation, which in turn leads to damp mould problems. In order to mitigate the risk of penetrating dampness Building Regulations recommend, for most of the UK, against the injection of cavity insulation in existing brick faced walls where cavities are less than 75mm wide, unless there is some form of protection to the outer wall. Treatment with a Twistfix water repellent facade cream can provide such protection..
Twistfix Dry seal water repellent is a high strength thixotropic silane cream that offers a 100% vapour permeable waterproofing treatment for brick and stone structures including bridges, tunnels building facades & stonework. The silane cream penetrates deep into masonry until fully absorbed. Resistance to rainwater is normally achieved within one hour, ensuring the wall and the cavity insulation remains free from damp. This penetrating damp facade cream is applied quickly and easily using a brush, roller or spatula and is available in a 3kg tub, enough cream to treat 15 m2. Remember that a dry wall is far warmer than a damp wall. The same is true for insulating materials. So if you want your cavity wall insulation to save you money on your heating bills be sure to protect your wall and your cavity insulation from dampness caused by wind driven rain penetration. 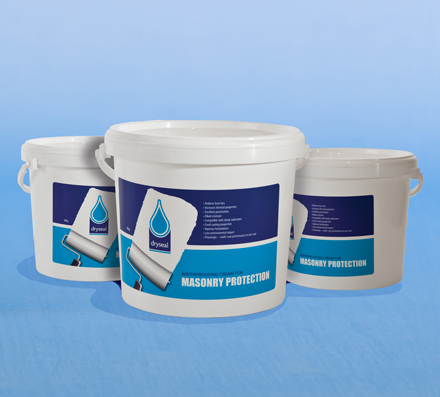 For more information on damp proofing products contact Twistfix on 0845 123 6006 or email info@twistfix.co.uk.